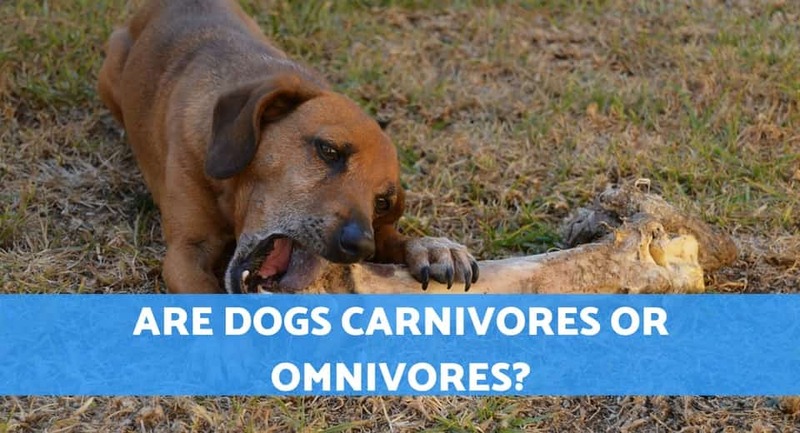 The debate as to whether dogs are carnivores or omnivores has been ongoing for decades. Recent research has shed some light on this subject that just may help settle this argument. When it comes to classifying animals, we have to look at the evolutionary process that they have undergone and the genetic clues in their physical features. Let’s dive into these clues and what modern science has told us as we attempt to answer the question, are dogs carnivores? Quick Answer: Whilst dogs are primarily classed are carnivores, it is known that wolves in the wild do consume ‘some’ plant-based materials from which they get nutrients. However, a Dog’s genetic makeup suggest they are in-fact primarily carnivores. The length of the gastrointestinal tract can have some bearing on whether or not an animal can be classified as a carnivore or an omnivore. Carnivores don’t need a long gastrointestinal tract as meat is very easy to digest, while plant foods are much harder to break down into digestible components. Herbivores typically have tracts that span the most length, hitting approximately 100 feet and have a fermentation system for cellulose. Omnivores – such as humans – have tracts spanning between 20 and 40 feet, and they also have an appendix, which comes from the remains of a fermentation system. Dogs, on the other hand, have tracts that are only two feet long and don’t have any spot for fermentation because it is unneeded for them. Based on gastrointestinal tract length, we would conclude that dogs are likely carnivores. It’s worth noting, however, that many do not consider gastrointestinal tract length to be a telling sign of diet. It makes sense that we would look at the digestive system of dogs to see whether they are omnivores or carnivores. After all, this is where food is digested. But to better understand this system, let’s talk about what is needed to digest plant-based foods. Plants contain a multitude of starch and cellulose, and specific digestive enzymes are required to break them down so they can be digested. The enzymes in question for the job are called cellulase and amylase, both which omnivores produce in their bodies. These enzymes break the amylase down into sugars so that the small intestine can absorb them and brings the cellulose for fermentation into macronutrients. Both omnivores and herbivores actually produce amylase right from their saliva, already beginning the process of breaking down the starch from plants the moment they begin to eat. Meanwhile, dogs do not produce any salivary amylase. Dogs also don’t have a high coefficient of fermentation, meaning they can’t successfully extract a good amount of nutrients from plant-based foods due to an inability to ferment them. Based on their ability to digest plants, we would suggest that dogs fall into the category of carnivores – and this is quite a telling revelation, given that this means dogs can’t get a lot of nutrition from plants at all. Omega-3 fatty acids are necessary for all animals, and it’s an essential acid that is not produced by any animal’s body naturally, so it has to be taken from the diet. There are multiple ways to get Omega-3 into a diet, including through fish, but vegetables are also a source of Omega-3. Leafy green vegetables contain Omega-3 in a form known as alpha-linolenic acid or ALA. In order for ALA to be beneficial to the body, it must be further broken down into two components: docosahexenoic acid, or DHA, and eicosapentaenoic acid, or EPA. These are the most active components of Omega-3. Both omnivores and herbivores can convert Omega-3 in the form of ALA into both DHA and EPA, but dogs can only convert between 5% and 15% of ALA into these two smaller components. Based on this, we would, again, say that dogs are likely carnivorous or very slightly omnivorous. Dogs Teeth – What Are They Designed For? Dentition plays a huge role in an animal’s diet. Plants require wider, larger teeth that have flat areas so that plant-based foods can be ground down for easier digestion. That’s why herbivores have teeth like this, with incisors designed specifically for the purpose of picking grass and long tongues to move the grass to the back of the mouth. It’s part of the reason you see herbivores chewing so much! Dogs like to chew a lot, you can even give them chew toys, and even rawhide chews to your puppies. Better than letting them eat rocks like some dogs tend to do! On the flip side, carnivores have sharp, pointed teeth that are meant to rip meat out from prey, separating it from the bone easily. It only takes a couple bites to get the meat ground to a good size, and then it is swallowed quickly. Their molars are also tightly digitized so that they can tear meat off without too much effort. Based on the dentition of dogs, we would once more posit that they are carnivorous. Let’s look a little bit into the ancestry of dogs. Dogs are descended from wolves, and most have found that wolves are carnivorous. While some findings suggest that they did eat berries or grains occasionally, foraging only makes up a very small part of a wolf’s diet. Dogs do have three genes that relate to the digestion of glucose and starch, which somewhat separates them from their wolf ancestors and cousins. This is mainly a sign of dogs adapting over the years and evolving from living alongside humans for 15,000 years to be able to eat grains and other varieties of vegetation. These findings suggest that dogs are mainly true carnivores. While they may enjoy some fruit, vegetable, or plant-based treats every now and then, they mainly require meat in order to survive. While denying a dog plant-based food will have no effect on them, denying them meat-based foods can have severe adverse effects. Does this mean you can’t give your dog plant-based treats? Of course, you can, as long as they are known to be safe for canine consumption! Make sure to only do this in moderation and as treats and to ensure that most of your dog’s diet is, in fact, made up of meat foods.